The world’s greatest road race returns to the Isle of Man this weekend with practice for the TT kicking off tomorrow evening. While the main races don’t kick off until next weekend, circuit signs are on the road, crash barriers are strapped to lampposts and ferries to the Isle of Man are jam packed, so in our eyes that means the TT has begun. 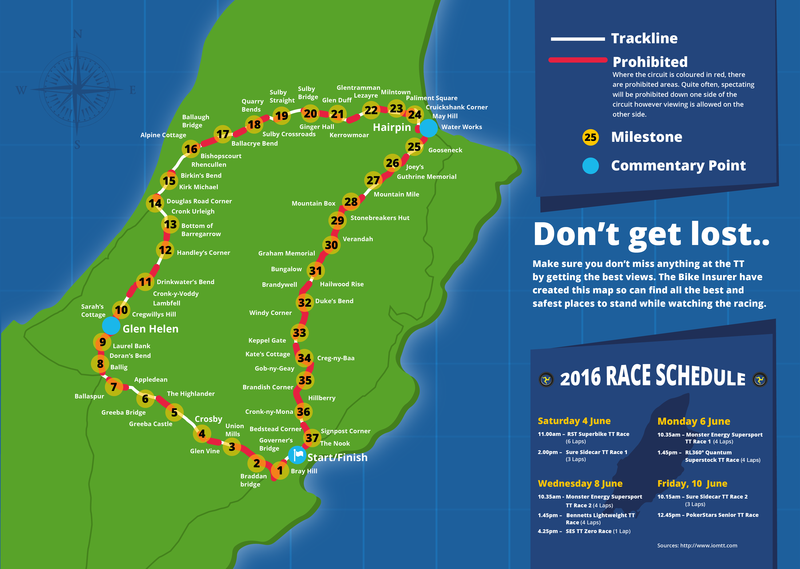 And with so many visitors already on their way to the Manx island, many for their first time, we thought we’d give spectators a little helping hand with where to watch every practice, qualifying and race. Our map not only shows you where you can stand and watch the TT, it also shows you where you can’t stand. For your safety, there are lots of prohibited areas along the route. We’ve highlighted theses areas in red however this may only apply to one side of the road, which means you can spectate from the other side. For example, at the Creg-ny-Baa corner, spectators are not allowed to watch from the field below the famous pub, but they can obviously watch from the pub itself behind the barriers. Our map is free to download, print off and do whatever you like with. To download the map, click on the image. It will open in a new window in your browser and you can save the map or print it off.